I vote this song into the 1960’s!!!! I still get requests for this song – even today!!! It is ranked No. 142 on the Rolling Stone magazine’s list of The 500 Greatest Songs of All Time. This was sent to me by Dr Alan Sissons. Sorry there is no score. “All I Have to Do Is Dream” is a popular song made famous by the Everly Brothers, written by the husband and wife songwriting team Felice and Boudleaux Bryant, and published in 1958. It was named one of the “500 Songs that Shaped Rock and Roll” by the Rock and Roll Hall of Fame and received the Grammy Hall of Fame Award in 2004. Please plan to attend this year! AND take part with the Prep Group. There is nothing MORE FUN than to grab your accordion friends – and play together. 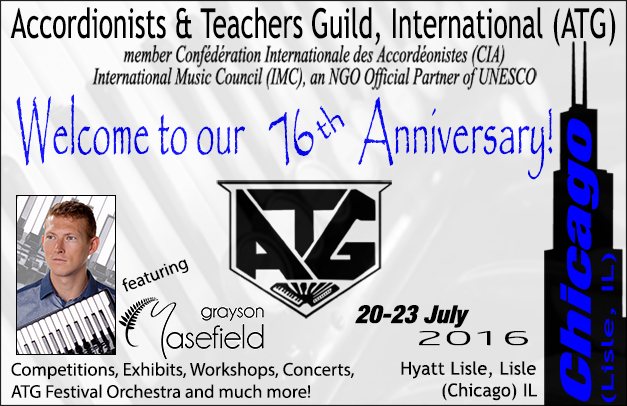 I am writing these arrangements especially for the ATG (Accordion Teacher’s Guild) in July 2016 in Chicago – where I will be conducting and teaching these arrangements! They are calling this the “Prep Group” – where they are encouraging the beginner to advanced intermediate accordionists with little or no experience playing with any kind of ensembles to have the opportunity to play with a group!!! AND this is for those of you that feel you are not GOOD ENOUGH to perform with the Festival Orchestra. If it is RED – then the link is live to the parts. I will have the rest available within the next few weeks. Please select the HARDEST part you will have time to learn and PLEASE KEEP the same part for all the songs. If you play at the Palmer Hughes BK 4 or higher level – please select the parts with left hand (4th). I will only ask a few of you to actually play left hand! Surfin’ USA is only a Trio – so those that selected 3rd parts – please take 1st on this one and those that selected 4th parts please take 3rd on this one. AND if these parts still look too hard to you – I am working to create 1 part for each that is REAL EASY – with NO 8th notes! – SOOO – email me (slee@shelialee.com) and I will send you those special parts! slee@shelialee.com I want EVERYONE TO PARTICIPATE! AND remember – this could be your first time ever playing with a group – I PROMISE to make it FUN and you WILL LEARN A LOT! So do your best to learn the notes and review the practice tips at each link – and I will pull the rest together!! You will pay a $5 fee for this music (on the ATG Registration Form) – This $5 will be my only compensation. The ATG Board is afraid this is NEW and no one will participate. Let’s please prove them wrong – sign up and download the music!!! I will see you in Chicago!! I posted this as a Trio last year – under a lesson and I think NO ONE KNOWS it was there!!! SO here it is on it’s own page and I turned it into a Quartet. AND I wrote the SAME bass line on all the parts. You can decide which section is to play the basses (only one section needed) AND SEEING the basses – really does help with the counting even if you do not play the basses!! ALSO – this July 2016 – In Chicago – at the ATG CONVENTION – I will be conducting a PREP GROUP. 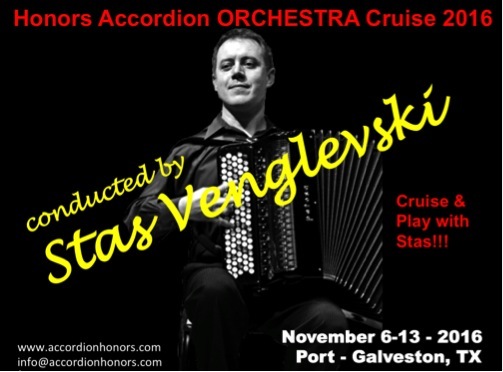 This is designed for those accordionists that don’t feel they can play good enough to be in the Convention Orchestra or have no experience with group playing. We will be doing some FUN SONGS – and this is the first of them!!! So here are some practice hints for the player and the conductor. DO NOT PLAY LEGATO – even on the opening runs – play them “full value” but release after each note and between measures – even practice as a group STOPPING AT EACH MEASURE!! Section #19 – Mearue #19 & #20 – 1st – WATCH OUT – You will hit SQUARE on the 3rd count! AND all parts are back to NO LEGATO! Section #27 – 1st & 3rds can play Legato (after they have HEARD it done detached – so they stay together) 2nds can smush it all they want!!! You can even encourage them to FAKE some rhythmic patterns on their chords!! Section #35 (CODA) – can be legato again for 1st & 3rds. EXCEPT – the Last 2 measures – every part NEED TO DETACH – almost ACCENT EACH NOTE! Maske in Blau (Mask in Blue) is a grand operetta in two parts (six scenes) with music by Fred Raymond to a libretto by Heinz Hentschke and Günther Schwenn. The work had its premiere under Werner Schmidt-Boelke on 27 September 1937 at the Metropol Theaterin Berlin. It was revived on 20 March 1955 at the Théâtre Municipal, Strasbourg under the title Le masque bleu. Every year – I have attended the National Accordion Convention in the Dallas area. It is attended by about 200 accordion enthusiasts. 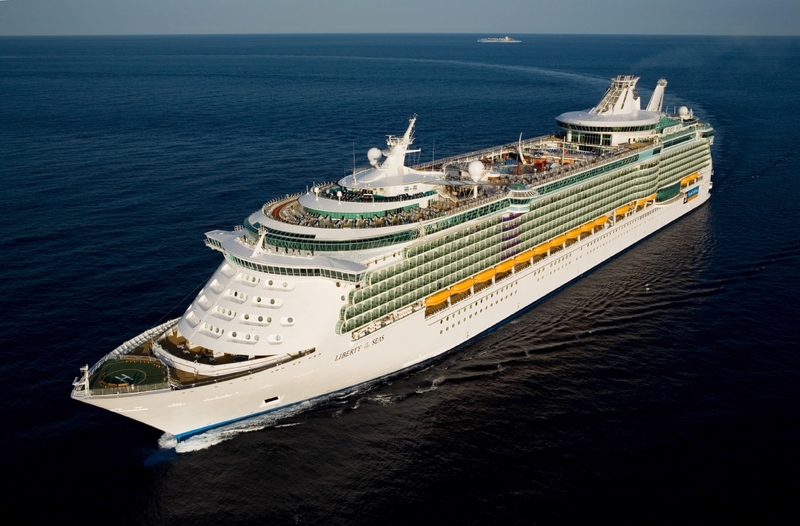 There are workshops, 3 different level accordion orchestras to play with and evening concerts. In 2016 – I will be conducting a Workshop – about THIS ACCORDION BLOG and Distance Learning via Skype and FaceTime LIVE lessons. See the links below for the Orchestra arrangements!